This post contains affiliate links. This means that if you click on a link and make a purchase I will receive a small commission at no extra charge to you. This helps me a lot to keep my blog running and I thank you for each and every click! You can see my full disclosure here. 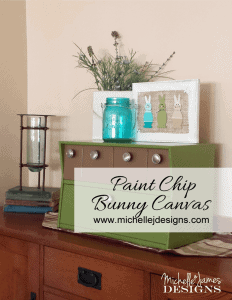 I love cork crafts and this one is a fun and easy one. 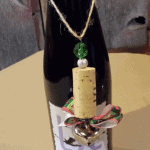 Peggy and I had taught a workshop using wine corks at our local winery, Little Swan Lake. You can see those projects here. 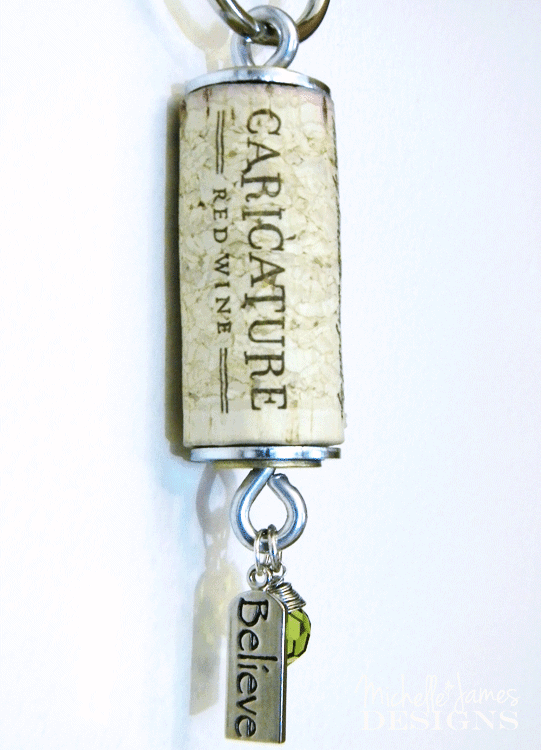 I hope you enjoy this Cork Craft Keychain Tutorial. Choose your cork. 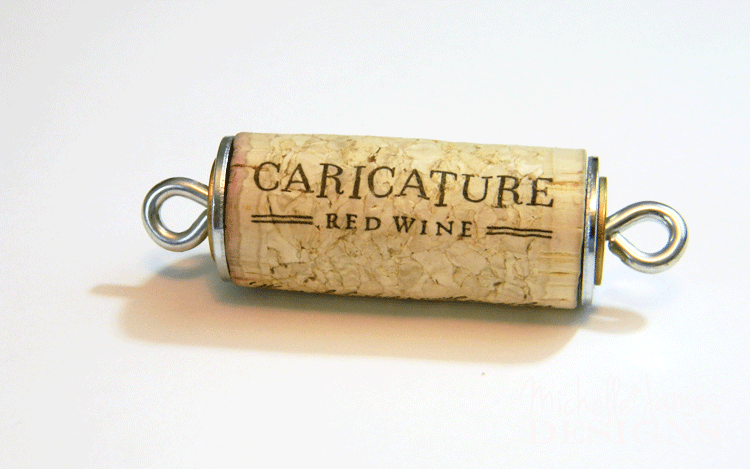 I am making this keychain for my friend Maureen and she loves this Caricature wine. The corks are so fun sometimes. My favorite cork so far is from Cupcake wine but I have noticed they are moving over to some twist off tops now. Boo! I usually buy a bottle if it has a cork so I can keep using them. 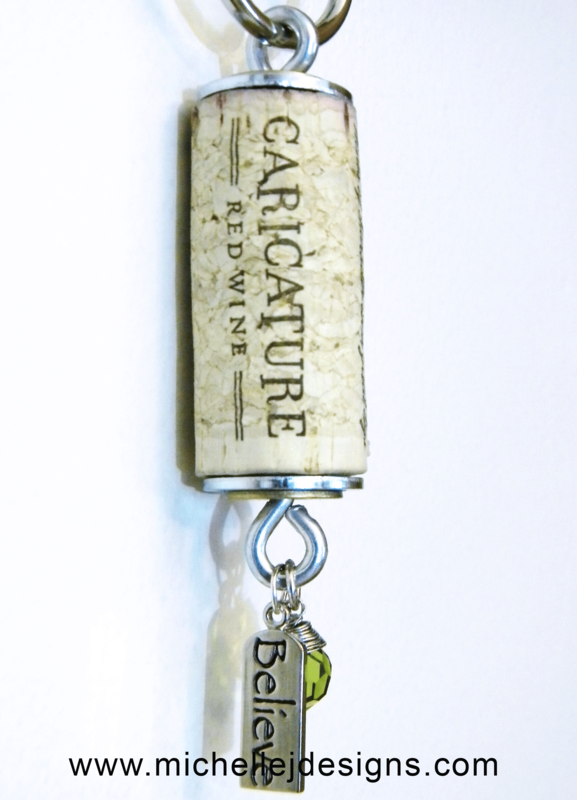 You can purchase corks as well if you are not a wine drinker or you want to make several key chains and just don’t drink THAT much wine. Gather your supplies. 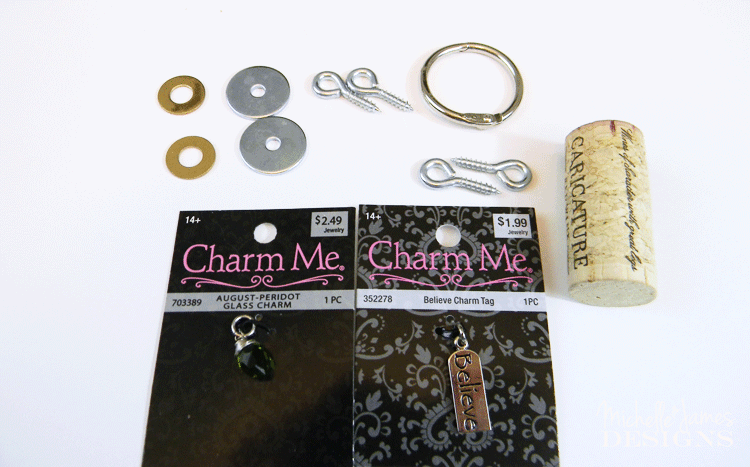 You will need eyelets and washers, beads and/or charms (I had mine already but I love these from Amazon), head pins, wire cutters and a small pair of pliers, glue and a ring key holder. I have one of these 3 piece jewelry kits and I use it a lot. It includes wire cutters and some pliers. 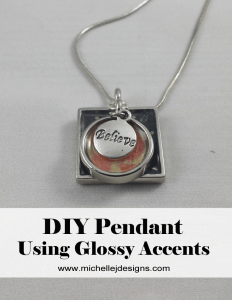 It also has the round nose pliers that are perfect for making your own jump rings or creating a round piece at the top of a bead with the head pin if you are creating your own bead charm. If you are using a ready made bead charm as shown below you won’t need the head pins. The top and the bottom of the key chain is where we add the eyelets and 2 washers. The key holder goes at the top and the beads and charms at the bottom. Put some glue on the smaller washer and place it on top of the larger washer. I like to purchase the two different color washers. I think they look nice. Glue both of these onto the ends of the cork. The washers are super cheap at the hardware store. I think .10 each for the silver ones and .06 each for the gold ones. The larger washers I used are 1 inch and the smaller one is 1/2 inch. Screw the eyelets into the top and the bottom of the cork. Try to make them straight. I usually have one that is a little crooked. I don’t know why. 5. 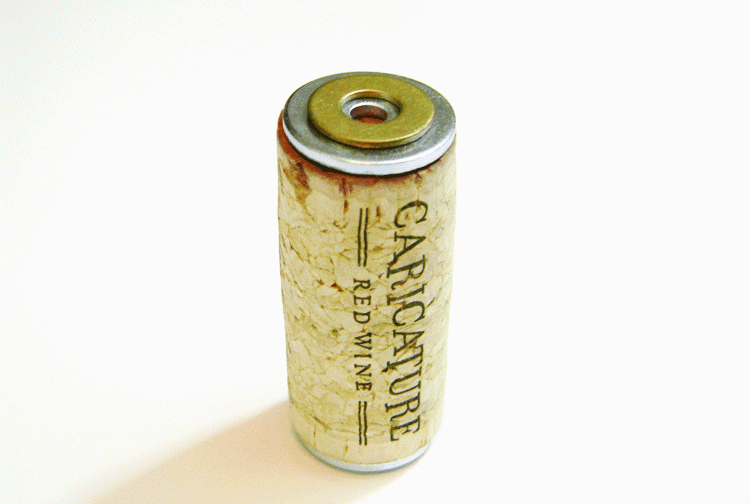 The bottom of the cork is where you get to add the fun stuff. I used a bead and a charm because I am crazy like that. Attach your fun stuff to the eyelet with jump rings. I choose the green bead for Maureen because she is Irish. I hope she likes it. 6. Then add the key ring and it is all done. Easy peasy! What do you think? The hard part is drinking the wine just so you can keep the cork. Have fun with this one and add some fun charms and beads. I love this cute keychain! What a fantastic idea for a winery to have a workshop on crafts using corks! I have bags and bags of corks waiting for a project. I like this idea because it is quick and simple and results in a usable, adorable, giftable keychain. Thanks for sharing this , Michelle! I am off to Michaels to buy the additional supplies! Wendy. I am so glad you like it. You need to start using up those corks!! Love your cute keychain! It would take me forever to get to the cork, LOL, I don’t care for wine, but I think Michaels sales the corks. Thanks for sharing your wonderful tutorial. I think I have seen corks at Michaels. I hope you give it a try. Thanks for stopping by. I love this, Michelle! It would make such a fun gift. There’s so many nice possibilities with beads and accessories – making it so easy to personalize. Thanks for sharing your creativity. Pinning & sharing this! 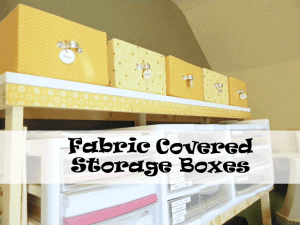 Karen – thanks so much for pinning and sharing. I really appreciate it. I am so glad you like it. So easy and fun to create. I LOVE this!! Really! I save my corks and have been trying to think what I want to do with them. I must try a few of these! Thanks Crystal. See, now you can do something fun with these guys. I made some last summer that did not include the washers or beads. Just the eyelet and the key ring. They were not fancy and I sold them at a garage sale. They ALL sold. These would be even better! Thanks so much for stopping by. What a fantastic idea for wine lovers! I have a few friends who love wine and this would be a great birthday or welcome to your new place sort of gift. I like how you can customize for each of your friends. Thanks for sharing this cute and fun idea! Hi Elna. 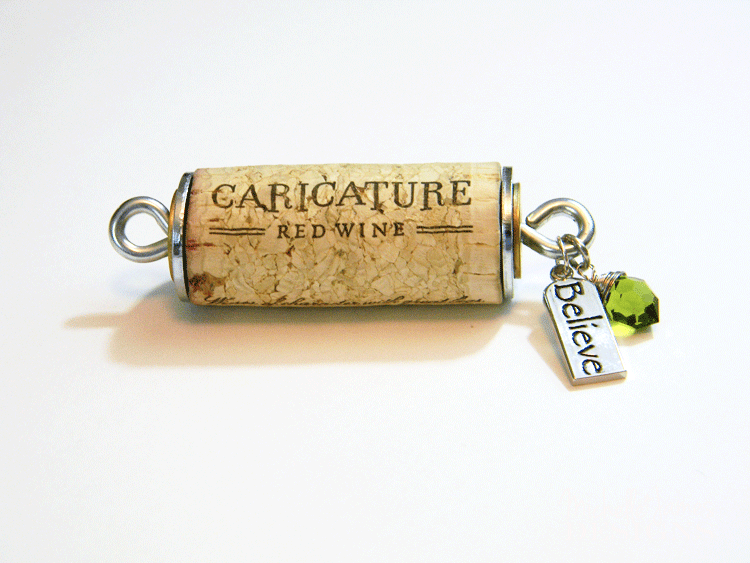 I am definitely a wine lover and I do love to create fun things from the corks. This one is my fave though. Thanks for stopping by. Love these. 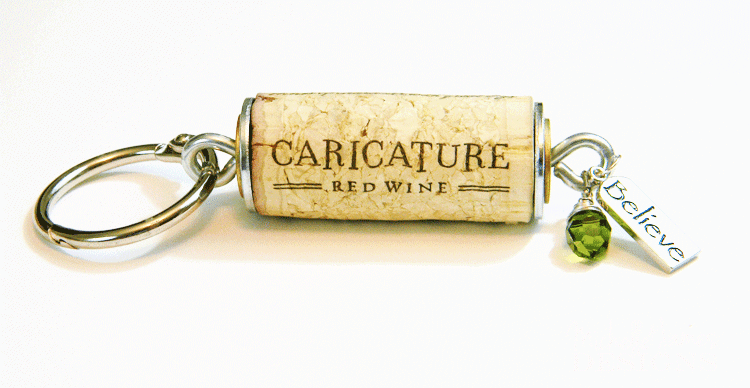 My Mom has around 300 corks at her house, so I should nab a few and make these for stocking stuffers next Christmas. It looks easy to do, and they’re so cute. The number of charms available seems endless, so it would be easy to customize them for different people. Hi Kara – I love that your mom has about 300 corks. 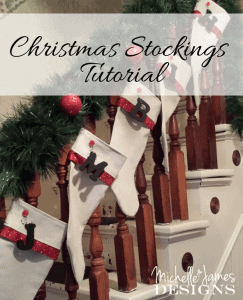 Yes, they are perfect stocking stuffers and making them personalized is what makes it more fun. I am glad you want to try it. Thanks. What a cool idea! 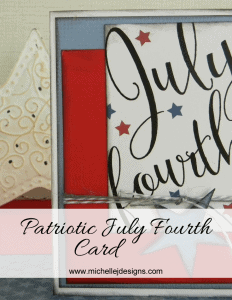 These look pretty quick to make and can even be used for small gifts or swag. Julie – I love the idea of swag. Thanks so much. Thank you Brenda and thanks also for stopping by! Hey Michelle! I just wanted to let you know that this awesome keychain is going to be featured on a roundup of my favorite things from May tomorrow. I hope it brings you some traffic! Thanks so much Nicki. This made my whole day. I appreciate the share. Thanks Loni and thanks for stopping by! I have lots of corks and many of these supplies from other craft projects. Can’t wait to try my hand at making these cute keychains. Yay! They really are a lot of fun and super easy. They make great gifts too. Glad you like them and thanks so much for stopping by! What size Washers did you use here? Hi Taylor, The larger one is an inch and the smaller one is 1/2 inch. Let me know if you have any other questions. I updated the post to reflect the sizes. I can’t believe that wasn’t in there. Thanks! Thanks for sharing. These look fantastic. 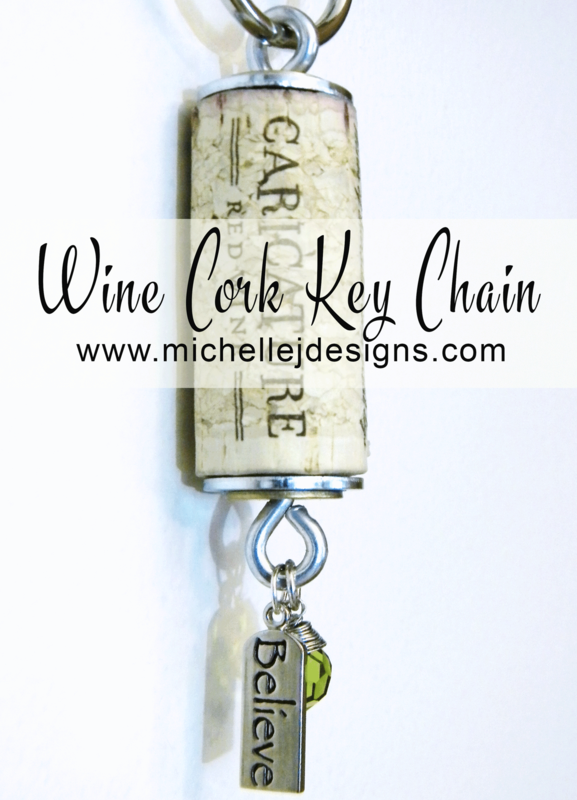 I’m about to make a few for fun gifts and wondered if you have had any problems with the weight of the keys pulling the eyelet out of the cork? Would it help to put glue on the eyelet before screwing into the cork? Hi Theresa. I have not had any problems but it would probably be a good idea anyway. It never hurts to be too cautious. I am glad you like them and are going to give them as gifts. They are so fun! Love these. Thanks for sharing! What type glue did you use? Hi Rita. I always use Beacon Fabri-Tac whether I am using fabric or not. I love it. I am glad you like them. I really need to make more. Thanks for the instructions, but how do the eyelets stay in? Sometimes the corkscrew goes through or is crocked. What condition or type of cork do you suggest using. Are the eyelets secure or do you add some glue around it also? I know some are not really cork, have you tried them and do you like them? Hi Cheryl, I think adding some glue in with the eyelet would be a great idea. They screw in so that helps to “grip” them but glue would not hurt a bit. I have not used the non-cork version so I am not sure how they would work. They may be better. I have had a few corks sort of crumble a little and maybe those would not do that. I love this cute little keychain! What a great idea! Thank you Carolann! I need to make another one for myself. I gave mine away. LOL! Thanks for stopping by.